What’s the Best Mini Kegerator? Mini kegerators are an affordable way to enjoy beer on tap in your home bar and outdoor kitchen or during big parties and holiday get-togethers. They’ve really come into their own over the past decade or so and now there are dozens of different makes and models available for the discerning beer connoisseur. 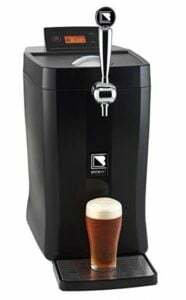 Whereas in the past beer producers were often reluctant to market small volume kegs, today many are rushing to respond to the demand created by the popularity of mini kegerators. 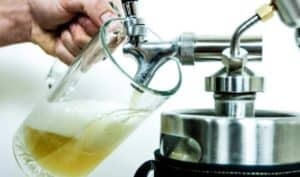 Below we’ll take a look at the 5 best mini keg dispensers out there and provide some tips on what to look for when purchasing one. The Keg Smiths 128 oz. 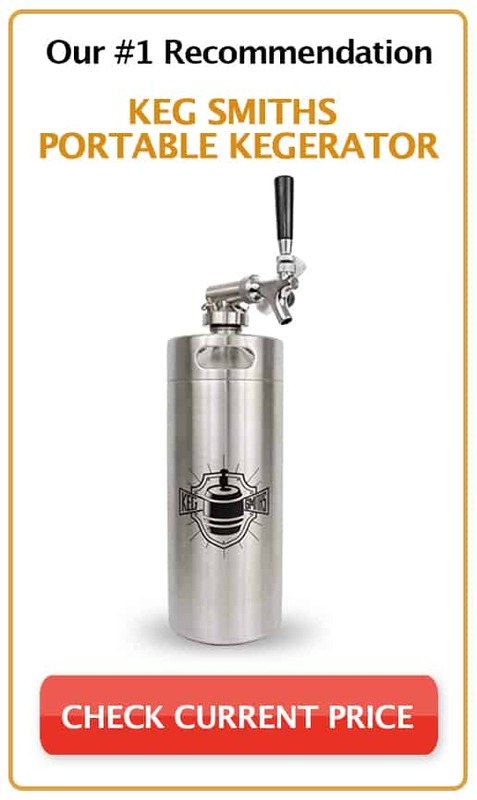 mini keg system is an attractive way to bring the joys of craft beer to your guests. It’s also a an easy method of keeping a few cold ones on tap while you watch the game on a Sunday afternoon. This portable draft system is compatible with a variety of CO2 cartridges and features an adjustable pressure regulator to control flow volume. 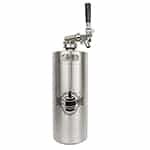 This 5-liter kegerator is fashioned from durable stainless steel so there’s no need to worry about it breaking like you would with a glass growler. 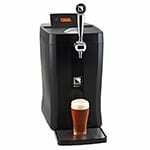 This mini keg fridge also makes it quick and easy to force carbonate a particular beverage should you want to. Just set the pressure to 15 psi or higher (depending on your preferences) and let the system work its magic overnight. It’s also a breeze to dismantle and clean the entire cooler should you want to change up beverages or refill its contents. Some people think the new Fizzics Original beer enhancement system and small kegerator looks like it came from the set of a sci-fi film, while others think it looks like the love child of R2D2 and a trash can. Whichever camp you fall into, you can’t deny that this half-gallon portable beer enhancement system is both innovative and reliable. Perhaps the best part about the Fizzics Original beer system is that there’s no CO2 or nitrogen cartridges to mess with. Instead, Fizzics relies on sound to work it’s foamy, tasty magic on whatever lucky beverage you decide to use it with. Set up is a snap. Just attach the pour handle at the top and the rubber mat under your glass and you’re good to go. Once set up, all you need to do is to take a bottle of your favorite brew and place it inside. Place the tube from the tap down into the bottle then snap the lid closed. Now you’re ready to pour. 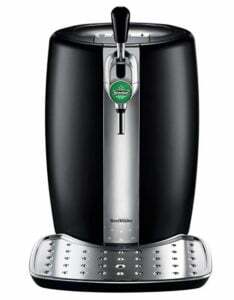 Pull the tap forward like a good bartender and when the glass is about 3/4 full, press the button on the tap. 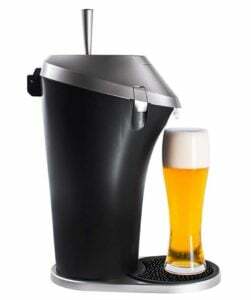 This mini keg cooler then uses sound waves to produce a robust head and take some of the edge off the taste. If there’s a better-looking piece of consumer-grade beer dispensing technology than the Krups small keg dispenser then we haven’t seen it yet. This kegerator is sleek, well-balanced, and does a great job of dispensing ice-cold brews from any 5-liter keg of Heineken or Newcastle Brown Ale. It sets up in just a couple of minutes and once it’s ready, all you need to do is plug it in and you’re good to go. The Peltier cooling mechanism keeps your brew at a steady 37.4 Fahrenheit, and there’s an LED indicator that turns green when the beer has reached optimal temperature. As long as you keep the kegerator plugged in, your brew will be good for 30 days. 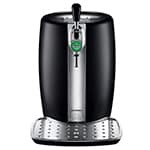 The only drawback of this handsome, reliable home draft beer system is that it’s only compatible with the aforementioned Heineken and Newcastle mini beer kegs. 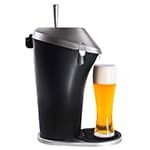 The BrewFlo cooler makes it easy to dispense your favorite beer, complete with a nice foamy head, without having to attach any external CO2 tanks. This mini keg dispenser enables you to easily set your serving temperature via control buttons on the top and a built-in display screen. The same screen that displays the current temperature of the beer also shows you how much of it remains in the BrewFlo keg cooler. That way, you’ll never be caught brew-less and unawares during a party. Setting up the BrewFlo mini keg fridge takes only a few minutes because there are disposable beer lines and keg liners which minimize cleanup. Another advantage is that the cap on the tap handle is replaceable, so you can customize the look of your BrewFlo spigot. Just fill one of the keg inserts with your favorite brew and slide it into the BrewFlo. Then close the lid, let it cool, and you’re good to go. The uKeg 128 oz. 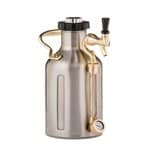 Pressurized Growler makes it incredibly easy to chill, transport and serve your favorite beer. 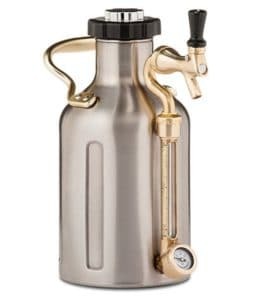 All you need to do is fill up the uKeg with your favorite brew, slip a CO2 cartridge into the cap and then screw the cap — cartridge and all — in place on the growler. That’s it. Once full, you can adjust the pressure by turning the cap and watching the pressure gauge on the side. While not technically a mini keg system, the uKeg 128 serves exactly the same purpose of allowing you to dispense draft beer where you want and when you want. It will keep your brew fresh and properly carbonated for up to 2 weeks, and the vacuum-sealed, double-walled stainless steel construction allows it to really hold a chill. There are no mysteries with the uKeg — it’s simple, handy and affordable. Ease of Assembly – A small kegerator is supposed to be convenient, so it doesn’t make sense to buy one that requires a lot of assembly. The simpler it is to assemble, use and maintain, the better. Cleaning – If you use your kegerator on a regular basis then you’re going to need to clean it on a regular basis as well. So make sure you get one that can be easily dismantled, or, like the uKeg 128, simply needs to be rinsed out after use. Pricing – Small kegerators vary wildly in price. They can go from as low as $100 to as high as $1,000 or more. If you’re on a budget though, you should be able to find a perfectly good unit for a couple of hundred bucks. 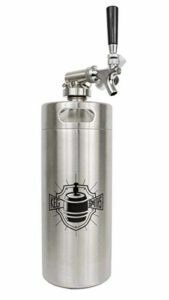 With the variety of mini kegerators and keg-type dispensers on the market today it’s hard to figure out which is the right one to get for your homebrewing operation. Keg Smiths is, for our money, the best example of what a mini keg cooler should be. It’s portable, well-constructed, and compact enough to be stored away easily. It’s also compatible with a variety of CO2 cartridges and can be set up, dismantled and cleaned easily. 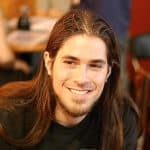 Lest we forget, it’s also handsome and affordable. In other words, if you don’t know which small kegerator to choose, you can’t go wrong with the Keg Smiths 128.